It seems that HamQTH.com become more and more popular. Yesterday I found out that my profile at qrz com has been deleted. It was without any warning or email notice. I'm just deleted :-). No problem, you find me at www.hamqth.com/ok2cqr. Please be aware of qrz.com, if you do something what they don't like, you'll be deleted without any warning! 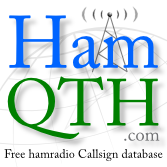 Use HamQTH.com, which is free callbook available for everyone! Lithuanian Amateur Radio Society - Lietuvos Radijo Mėgėjų Draugija (LRMD) organizing special event stations operation on the air from 2011-08-31 till 2011-09-18 to mark 37th European Men's Basketball Championship in Lithuania.